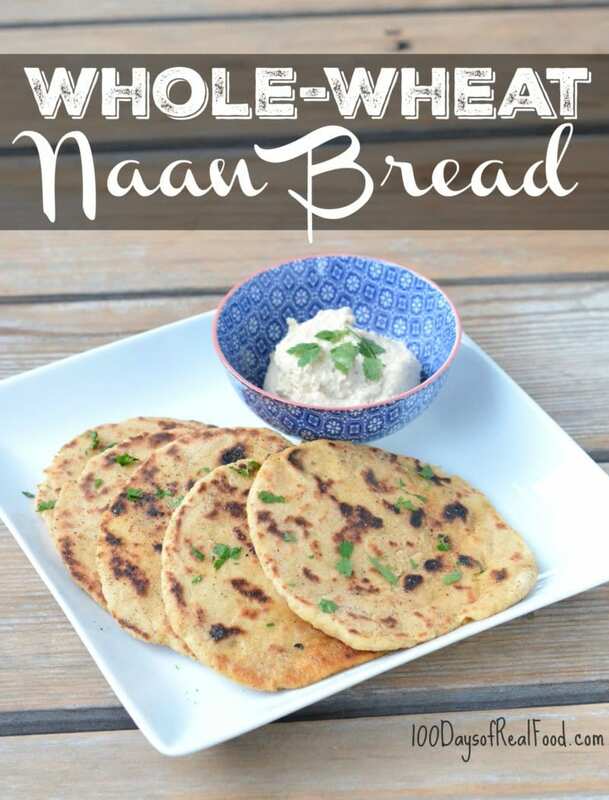 I tried making whole-wheat naan, and it was so fun! And now I get to share the recipe with you. :) I found a reliable white flour recipe and made all the right modifications for this to be “real” and still yummy. My kids scarfed them down so I’ll definitely be whipping these up again very soon. They really were not too hard to make at all (especially if you have experience making homemade tortillas)! Enjoy. Add the water to a large glass measuring cup or medium bowl. Sprinkle in the yeast and, if using, the sugar. Yeast will bloom without the sugar, but it can sometimes be hit or miss. Let it sit until the yeast foams up, about 5 or 10 minutes. Add the flour and salt to the bowl of a stand mixer fitted with a dough hook. Mix together to combine. Add the oil, yogurt, and egg to the yeast mixture. With the stand mixer running, slowly pour the yeast mixture into the flour until the dough comes together into one ball that comes clean from the sides of the bowl. Add additional pinches of flour (if too sticky) or additional drops of water (if too crumbly) to help it come together. Place dough in a bowl coated with olive oil and cover with a clean dry towel. Turn your oven OFF and place bowl in the oven to help speed up the rising process. Make sure the towel is only touching the bowl and not the hot oven steel grates. Let it rise until it doubles in size, 45 minutes to 1 hour. Add a dab of ghee (or olive oil) to the pan and cook until the naan bubbles up and browns on the bottom. Flip and cook until golden brown. It only takes a minute or two. Brush finished naan with melted butter and transfer to a covered plate to keep warm. Repeat until done and serve with hummus and fresh parsley if desired. Peanut/tree-nut free if served with tree-nut free hummus. Can I use a regular skillet in place of cast iron? Thanks! Yes, you can try that – the nice thing about cast iron is it gets really hot and stays hot. Good luck! I have everything, except Greek yogurt. Can I substitute with sour cream? I have not tried that yet myself … let me know how it goes! Can you do this without a stand mixer and use a hand mixer and no dough hook? I think making it by hand would be better than a hand mixer. Can I substitute plain whole milk yogurt for the Greek yogurt? I would just use a bowl and a wooden spoon. Most bread doughs can be made by hand and I am pretty sure most people in India make it that way. The dough hook is just for convince. Though you will probably want to knead the dough a few times to thoroughly combine it. Yes, freezing these will be fine. LOVED the whole wheat naan. Thank you for such a great recipe – easy, great tasting, perfect to add into the weeknight rotation. I applaud your receipe and I enjoy your site. But, this isn’t naan, this is a paratha. Naan doesn’t use yeast, is white flour & is made a stone oven. 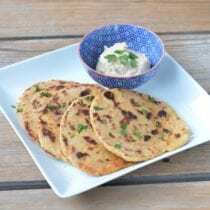 What you made is a paratha- whole wheat flour & is made in a pan. Indeed, this is tasty & made quite regularly. Can I make these with white whole wheat flour instead of the pastry flour?